Weapons like the bow and harpoon. Are very powerful against enemy pirates. If you don't explode the barrel, you can blow it up with another projectile next turn. Use treasure gems to unlock new crew members. 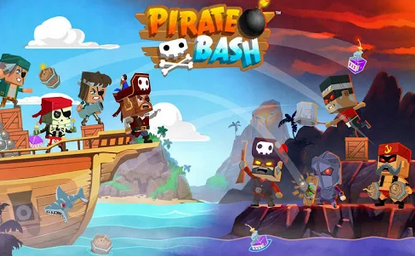 Take your crew members to the open sea to battle other players and earn rewards like rep points and jolly rogers. Weapons improve the rarity. The bow shoots more arrows and the barrel explodes with a wider attack radius. Launch a weapon at the maximum speed to do the most damage. Stuck on a stage? Replay other stages to level up your crew members and earn silver coins for the blacksmith. Enemies may drop crates that contain silver keys. Do you want weapons used by the enemy? Seek and Recruit the pirates who have them. A new crew member is unveiled when and world is cleared. Find Treasure Crates in stages to earn rare gems which can unlock or upgrade your crew members. Silver and Gold Chests contain weapons that can increase your crew member's atk and hp. Turn order depends on where you place a pirate on your ship. The pirates near the front go earlier. Each pirates weapon is unique, use the recommended pirate for each stage to improve your chances.